Posted on November 28, 2014 by Eduardo Marin, D.Min. 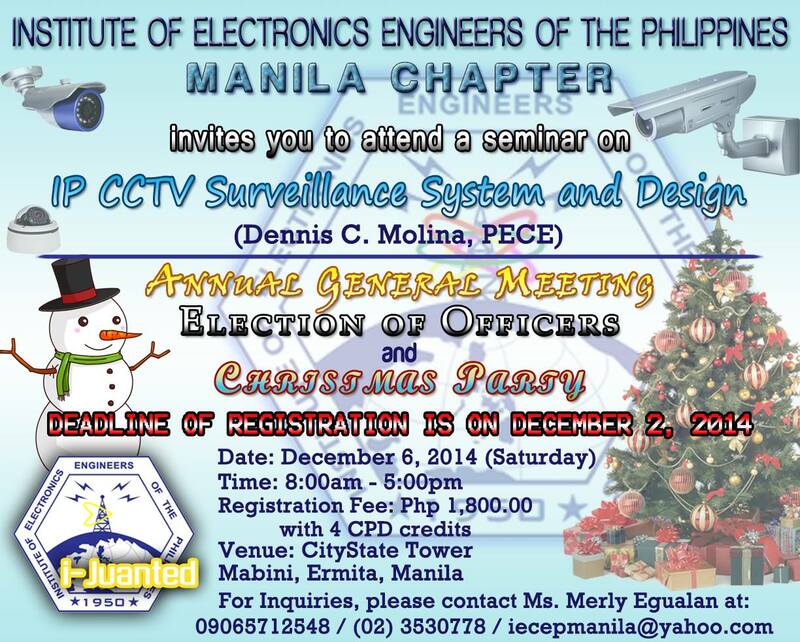 IECEP Manila Chapter invites you to attend a technical Seminar and IECEP Manila Annual General Meeting 2014. Registration fee is Php 1,800 with 4 CPD credits will be given to participants. (Inclusive of IECEP Manila Polo Shirt, Lunch and Snacks) Should need more information and further inquires of the seminar contact directly (09065712548) (02)353-0778 (Ms. Merly Egualan- IECEP Manila Secretariat) or send email to iecepmanila@yahoo.com. Kindly deposit a registration fee to BPI Acc. Name: IECEP Inc. BPI Acc. No: 8111-0060-09. Please email us a deposit slip and registration form to iecepmanila@yahoo.com for confirmation of attendance.